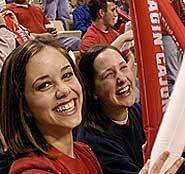 Students at the University of Louisiana at Lafayette will receive a warm welcome when they return for Fall 2004 classes next week. Although classes start on Monday, the Welcome Week celebration will get started Sunday with a free barbecue at the band field behind Angelle Hall. The dinner starts at 5 p.m. and is free and open to all students. On Monday students will be greeted with doughnuts and fruits on Rex Street. University administrators, coaches and student leaders will be handing out the treats that morning as students head to class. Other plans throughout the week include a Residence Hall Association and Greek Affairs giveaway on Rex Street Tuesday at 10:30 a.m. and Get on Board Day in the Quad for organizations starting at 10 a.m. on Wednesday. On Friday students, faculty and staff can enjoy free breakfast in the Quad at 7:45 a.m. followed by a Block Party on Rex Street at 11 a.m.
For more information about these activities, call 482-6944.